My Creative Time: MCT 74th Edition Release Blog Hop & Sale! Our new stamp & die set is available for purchase HERE! Don't forget to use the code DEC2017 to get a discount off of your entire purchase! Special discount applies to in-stock items only! Now I introduce to you the most ADORABLE snowman set....."Chill Out!" For our blog hop giveaway, I will be giving away a $50 gift card to the "My Creative Time" store to one LUCKY winner! All you have to do is leave a comment on each of our blogs! You are not required to comment on EVERY SINGLE blog, but the more you comment on, the MORE chances you have for winning! VERY IMPORTANT, PLEASE leave a way for us to contact you in your comment just in case "YOU" are the lucky winner! I will announce the winner on my blog on Wednesday, December 20, 2017. We are not offering a FREEBIE this time around, but since it is the end of the year, we thought we would change it up a bit! I will be drawing 12 names from the FIRST 75 shoppers! Each person will have the AMAZING opportunity to OWN one of the new releases for 2018!!!! For Example, winner #1 will win the ENTIRE January Release, winner #2 will win the ENTIRE February Release, winner #3 will win the ENTIRE March release......and so on! The first 75 shoppers will be entered into the drawing starting THIS FRIDAY, December 15, 2017 at 8am PST when the sale & new release item goes LIVE! ALL 12 winners will be announced on New Year’s Eve on my Blog! You can pick up our ADORABLE new "CHILL OUT" stamp & die set HERE! The OVERSTOCK sale is going on now HERE! Okay, now onto our WINNER from yesterday's sneaky peek! Absolutely ADORABLE! 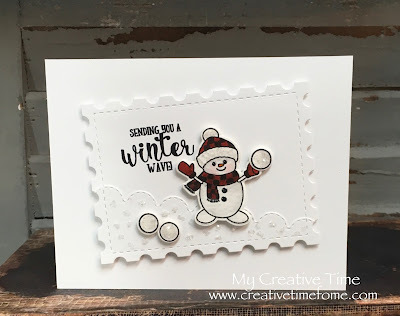 I love the cute note cards, awesome coloring, cute snowman and sentiment too! Have a wonderful day, Migdalia! lovin the snowmanso sweet!!! great card!!!! Love love the new stamp! Can't wait to get it! Thank you for sharing your beautiful cards Emma!! 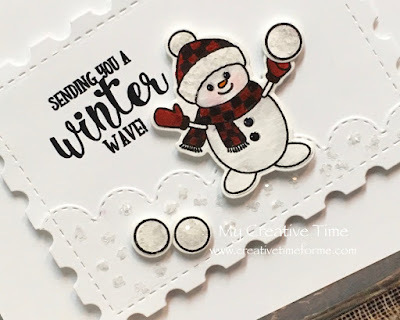 Such adorable cards!I love the snowman!and Yes! I agree it is the most adorable snowman set!! Thank you so much Miss Emma! !I already replied to your email.Can't wait to get it!! A huge thanks to the entire DT! Cute card and set! I like how you made the snowbank on your card. Thanks for the fantastic Giveaway!! I hope my name is chosen for one! This is a very cute set. Great ideas on the cards. Have a nice evening. Such a cute set for winter projects. 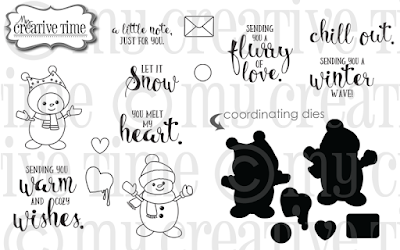 Ms. Emma this is such a cute set, my all top favorite stamps are snowmen, can't wait to get my set. I love your card, great job! All of the projects were adorable using this cute set! I love the faces and wonderful fonts on the sentiments. It is sad that Miss Brigit and Miss Nikki will be leaving the MCT team...I have enjoyed their clever talent and will miss seeing their projects. I hope you have a wonderful Christmas and a Happy New Year. I can't imagine what will be in the MCT releases. GOOD MORNING Miss Emma!! 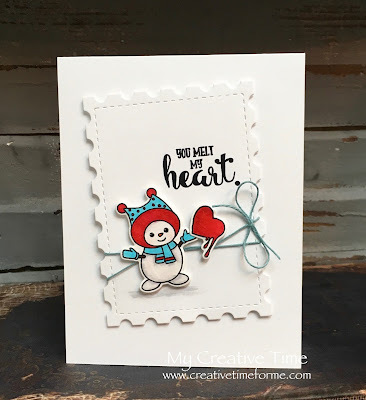 OMG What a Super Cute Card.....Love your little Snowball Playing Frosty....Adorable!! Your little scene is darling!! Great Creative ideas using your Stitched Postage Stamp die and loving your embellishing ideas!! Your New "Chill Out" Set is Adorabs Can't wait to get it!! Wishing you a Spectacular & Funtabulous Family Week-end!! So sweet! I just love this set!!! What a fun winter set! I love the giveaway drawing idea! Happy Holidays. Adorable snowman card! I love the CAS design with all of the white! The postage stamp die looks so awesome as well! I hope you are having a lovely Sunday! Your cards are so sweet.